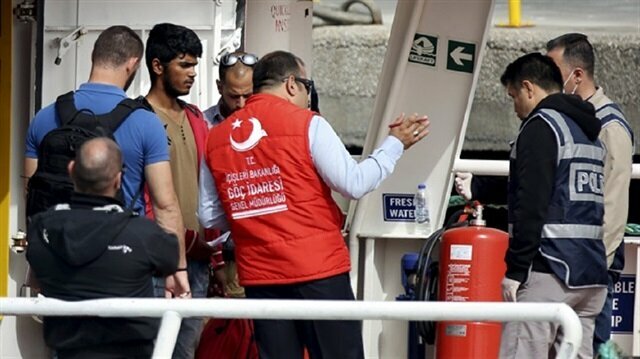 Turkish security forces on Wednesday apprehended a total number of 268 undocumented migrants during operations in three different provinces, security officials said. Turkish security forces held 208 undocumented migrants in several operations across the northwestern Edirne province, a source who spoke on condition of anonymity said. The provincial gendarmerie caught migrants from Afghanistan, Pakistan, Iraq, Syria, Bangladesh, Myanmar, Libya and Palestine, who were trying to cross into Europe illegally, the source added. In another operation, 47 undocumented migrants were held in Turkey's western Izmir province, a security source said. The gendarmerie caught the migrants who were trying to cross into Greece illegally from Izmir’s coastal town of Dikili, a security official, who asked not to be named due to restrictions on talking to the media, told Anadolu Agency. An additional 13 people including five Syrians, seven Iranians and one Afghan national, were held in the southwestern Aegean province of Mugla on Wednesday, a security source told Anadolu Agency. All the migrants were sent to regional immigration departments.